We are excited to announce our new Microsoft Reseller Store where you can purchase the most popular Microsoft software directly from My Phone Support. Get Windows 10, Office 365, and the new Office 2019. Have you ever been confused by your Wi-Fi router protocol type? Does your router use 802.11n or 802.11g or 802.11ac? Which is faster? Which is newer? Which is more secure? Worry no more; the Wi-Fi Alliance is updating the standard to have version names going forward. The next and faster version or WiFi will be WiFi 6 with speeds up to 10.53 Gbit/s. Intel CEO Brian Krzanich revealed in a CNBC interview that security vulnerability has been found in some Intel chips. Google discovered the problem several months ago and Intel has been working with OS partners to fix the issue. The vulnerability could potentially allow hackers "observe content" on a compromised machine. OS updates will likely be made available in the coming days. If you are using Wifi on your phone, computer, tablet, or any other devices, you have new security concern. Security researcher Mathy Vanhoef discovered some vulnerabilities in the WPA2 encryption method. This means that it could be possible for hackers to break WPA2 wifi encyrption in some scenarios. What should you do? First, make sure you have the latest update to Windows, Mac OS, Android, or iOS. This step alone should be the best protection against this bug. Second, see if your Wifi manufacturer has release a patch or firmware update: this site lists some. It was announced today the CCleaner was hacked and distributed malware hidden inside their program during the month of October. It is current estimated by Avast (owner of CCleaner) to have affected over 2 million computers. If you have CCleaner installed, we recommend removing it and installing an alternative PC cleaner like My Faster PC from ConsumerSoft. Well known antivirus company Kaspersky has been banned from use on U.S. federal Government computers. The Department of Homeland Security expressed "[concerns] about the ties between certain Kaspersky officials and Russian intelligence and other government agencies, and requirements under Russian law that allow Russian intelligence agencies to request or compel assistance from Kaspersky and to intercept communications transiting Russian networks. In the past, Kaspersky has been well regarded as an antivirus company and has helped fight against hackers and expose notable zero-day hacks. If you are a Kaspersky users, you may want to consider these new security warnings seriously. Equifax announced a major hack into their system - possibly exposing data on approximately 143 million U.S. consumers. Equifax is one of the three major credit rating companies in America, having access to data like social security numbers, addresses, credit history, income, etc. It is recommended that you use the Equifax "Potential Impact" tool to see if you may have been affected. If you have been compromised, you may want to either freeze your credit (at Equifax, Transunion, and Experian) or sign up for a credit monitoring service to watch for fraudulent activity. 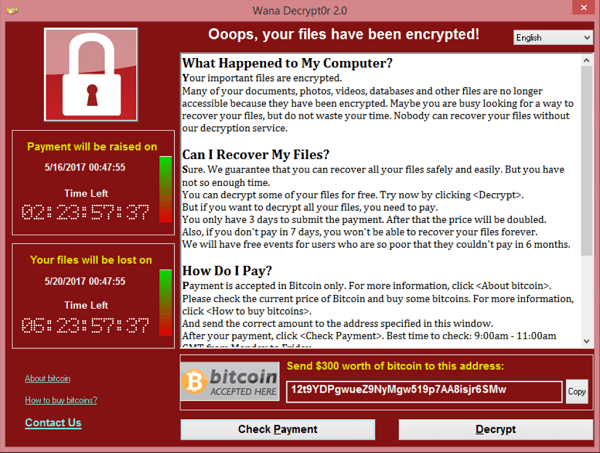 Over 200,000 computers were hit by the WannaCry ransomware attack. WannaCry was a worm that would encrypt a user's data and demand a bitcoin ransom for the data to be decrypted. Your best defense against WannaCry is to install all critical Windows updates which should close some of the zero-day vulnerabilities that WannaCry was using to infect computers. This is also an important reminder for having both a local backup and a cloud backup of all your important files, documents, and photos. If you need assistance with ransomware, making system backups, or other PC problems, please reach out to My Phone Support for assistance.